Mark E. Smith, the famously fractious front man of the legendary Manchester post-punk band the Fall — a group that existed for more than four decades — died last Wednesday at the age of 60. Under Smith’s lead, the Fall crafted a singular sound, featuring manic bass lines, borderline insane levels of repetition, and weirdo lyrics shouted in a heavy Mancunian accent. Smith was notorious for his confrontational personality and cutting wit, and hated on practically everyone and everything — from Kate Bush (“It’s like all these radio DJs have been raiding their mum’s and dad’s record collections and decided that Kate Bush is suddenly cool again. But I’m not having it,” he told the Manchester Evening News) to Thurston Moore of Sonic Youth (he once said that Moore should have his rock license revoked). Here are a few of the best stories from one of rock’s most legendary curmudgeons. Mark E. Smith, possibly wasted, spent at least one gig chasing a plastic bag around the stage to the immense bafflement of the audience. Were there song lyrics inside the plastic bag? Who knows? Smith was walking down the street in London when a man ran up to him — clearly a massive fan — and asked if they could work together. The fan was Richard D. James – also known as the Aphex Twin. As recounted on Twitter by the London record shop Electric Knife Records, Smith had a nice chat with James, pulled out a tiny matchbox, and had James write his phone number down on the matchbox. Mere minutes later, Smith had lost the matchbox, and they never worked together. Marc Riley was a key member of the Fall during one of their most legendary periods, from 1978 to 1983. According to the BBC, Smith “got rid of Riley because he didn’t like the fact Riley was questioning the writing credits, or the fact he danced to Deep Purple in a nightclub while on an Australia tour in 1982.” A fistfight apparently ensued. 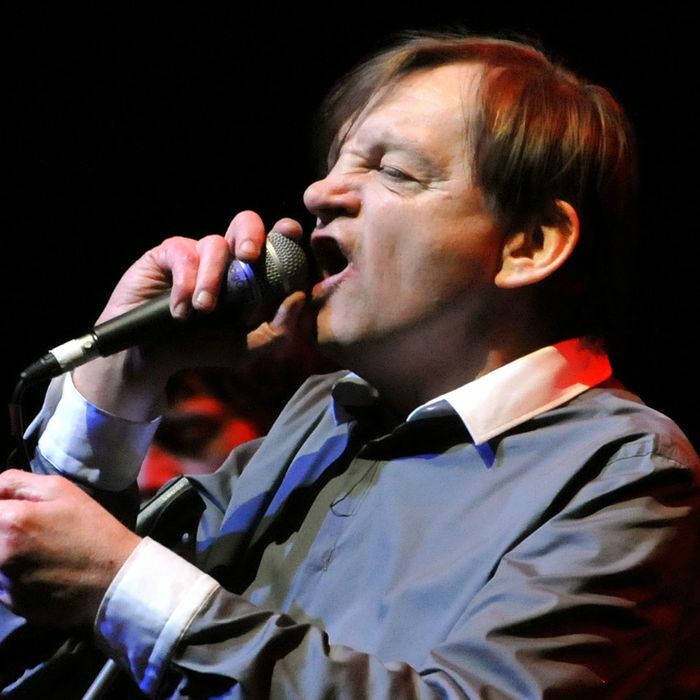 There were a whopping 66 members of the Fall, outside of Mark E. Smith, over the band’s existence. Some only lasted through Smith’s vitriol for a few months and themselves quit out of anguish, and several were unceremoniously fired by Smith in a shocking, bizarre or abrupt way. The lengthy Wikipedia entry “List of the Fall’s band members” is a true sight to behold. It even includes an intricate color-coded timeline where you can see where each member came in and dropped out. In 2005, the BBC brought Smith — a diehard fan of the Manchester City football team — on the air to read the daily football scores in his thick Mancunian accent. “Burnley 1, Leicester City nil,” he begins intoning hypnotically. “Coventry City 1, Ipswich Town 1.” And on and on, in a surreal, trancelike fashion, for the next seven minutes. It’s one of the stranger moments of sports commentary you’ll ever witness. Smith told his friend Dave Haslam once that he hated dogs with a passion — presumably because they make people happy. He also hated squirrels: In 2008, he said he would be pleased to “set about an endangered red squirrel with a set of professional hedge-clippers.” His claims of killing two squirrels led to an investigation by the Royal Society for the Prevention of Cruelty to Animals.